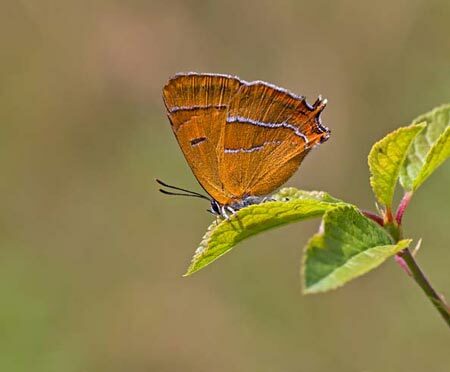 Special features: The brown hairstreak is the largest of our native hairstreak butterflies. In the male, the upper surfaces of the wings are all brown except for the orange tails. In the females, the upper surfaces of each forewing features a wide, bright orange band. The females also have the orange tails. The undersides of the wings, in both sexes, feature the characteristic white 'hairstreak' line. The females are easier to spot. On sunny days they feed on the nectar of wild flowers. The males tend to perch high in tree tops. Distribution: Found mainly in wooded areas of southern England and south west Wales. Food: Nectar. The larvae feed on blackthorn. Habitat: Hedgerows and the edges of woodlands.